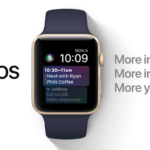 On top of announcing a preview for watchOS 4 at WWDC, Apple also quietly announced new Apple Watch bands for the summer. New Sport Bands are available in three new colours, while there are a couple new Nike Sport Bands to match the company’s Nike Air VaporMax Flyknit Day to Night Collection. Apple also said “As a celebration of diversity and inclusion”, a brand new Pride Edition Woven Nylon band is available in rainbow stripe. These are available now on Apple.ca, with delivery times slated as early as June 8th. Apple says these bands will hit Apple Retail and authorized retailers next week.